Curriculum Vitae - Boston Real Estate Attorney. Eviction Law. Zoning and Variances. Housing Discrimination. 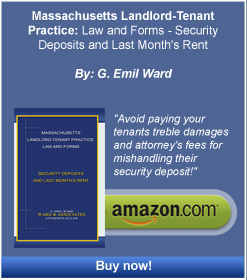 In 1996, Mr. Ward published Massachusetts Landlord-Tenant Practice: Law and Forms. In 2011, he published Massachusetts Landlord-Tenant Practice: Law and Forms – Security Deposits and Last Month’s Rent, which is presently available through the Amazon website. Attorney Ward taught as an adjunct professor of law at Suffolk University Law School in Boston, as well as having taught real estate courses at the BU Paralegal School. Attorney Ward has testified on numerous occasions before the Massachusetts House Joint Committee on Housing and Urban Development in favor of passing a mandatory rent escrow law, which would level the playing field in Massachusetts for landlords. Mr. Ward was a consultant to the Massachusetts Association of Realtors and to the Small Property Owners Association analyzing and critiquing bills having to do with mandatory rent escrow.